The exciting capabilities of ALLU’s range of Processors and Transformers will be on display at bauma China 2018, Stand A19. 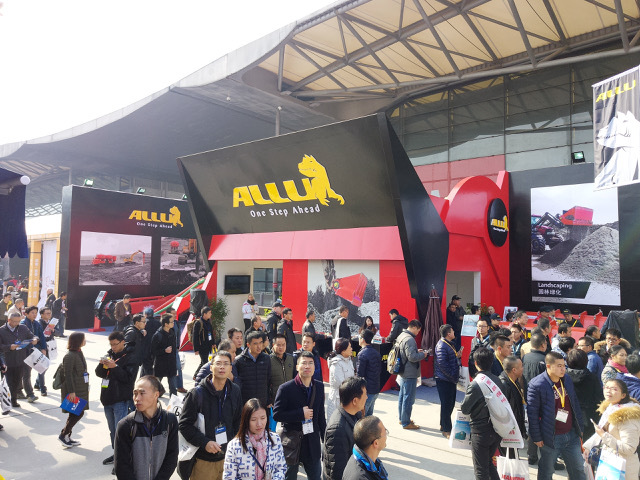 As the largest trade show in Asia, bauma China will set the stage for ALLU to show first-hand how its equipment can help construction companies maximise their business, whatever the application. Held this year from the 27 – 30 November, bauma China is Asia’s largest and most important international trade fair, aimed at the requirements of Asia’s construction industry. Encompassing construction machinery and vehicles, building material and mining equipment, the show takes place in Shanghai every two years. With more than 300,000 m² of exhibition space (indoor space: 200,000 m², outdoor area: 100,000 m²), 2,958 exhibitors from 41 countries will exhibit to more than 170,000 visitors from 149 countries. At this important trade show, ALLU will reaffirm its commitment to the Chinese and Asian markets by exhibiting a cross section of its Processor and Transformer technology. The ALLU Transformer Series will be a significant part of the ALLU offering at bauma China. This comprises an excavator/loader/tractor-mounted processing bucket that screens, pulverizes, aerates, blends, mixes, separates, crushes, feeds and loads materials. This results in the feed material being effectively transformed into highly valuable products, making any business more efficient and more profitable. Catering for applications of all sizes, and capable of processing any material that can be screened and sorted, the ALLU Transformer Series comprises the compact DL- and D-Series, as well as the truly massive M- and G-Series. All are designed to transform the way in which material handling and processing businesses are able to improve their efficiency and profitability. The latter have proved themselves on truly massive quarrying and surface mining applications throughout the world, being designed for use by excavators up to 300 tonnes. The ALLU Transformer, whatever its size and configuration, is ideal for processing concrete, waste, soil, sand, rocks and minerals, as it also aerates, as well as screening, loading and processing, all of which can be carried out onsite. This truly mobile solution provides the versatility and flexibility to enable work to be accomplished more efficiently, even in the most challenging environments. This results in substantial savings in material and transport costs, as no time is lost when waiting for replacement material. Additionally, binders can be mixed if the material handling includes additive requirements or stabilization. Also featured at bauma China will be the ALLU Processor. This is a hydraulic power-mixer attachment that converts any excavator into a powerful and versatile mixing tool, capable of penetrating and effectively mixing a variety of difficult materials. Suitable materials for the attachment range from clay, silt, peat, sludge and sediment, to dredged material and contaminated soil. Working to a depth of 3 m, and with a weight of 2,095 kg (+400 kg fabricated mount plate), the Processor 300 HD is designed to be durable. It’s made from wear resistant steel, with a stem that’s engineered to be strong, streamlined and lightweight. Fitted to and powered by the excavator’s hydraulic system, and benefitting from its ability to reach difficult or soft areas, the Processor 300 HD is able to mix materials everywhere the excavator goes. This means that binders or chemical agents can be delivered to the area of the highest mixing shear by an attached 80 mm diameter pipe, and injected via a nozzle located between the mixing drums. As with its smaller sibling the 300 HD, the Processor 500 HD is both durable and strong. It differs from the smaller 300 HD by being even bigger and by being able to work to a depth of 5 m, with a weight of 2,445 kg (+400 kg fabricated mount plate). Despite its strength, the wear-resistant steel stem is both nimble and streamlined, and is again powered by the excavator’s hydraulic system. It is able to reach difficult or soft areas, meaning that the Processor 500 HD can mix materials everywhere the excavator goes, with binders or chemical agents being delivered to the area of the highest mixing shear by an attached 80 mm diameter pipe. Both Processor models are equipped with automatic torque adjustment valves located between the two hydraulic motors, with drum rpm and temperature sensors, as well as sensors for oil leakage detection located inside the frame construction. The excavator operator controls the rotational direction of the drums to adjust for most effective mixing. A 2 m extension tube is also available for both models as an option for added working depth. In effect, both ALLU Processors provide a variety of uses, as they essentially reach, mix and process, whether the material is wet or dry. This has made them ideal in constructing temporary roads, solidification and soil remediation projects, dealing with contaminated soil, excavation and pipeline works, as well as oil ponds and sand acid tar. The ALLU stand will be located at A19. We look forward to seeing you in Shanghai.